Newberry Electric Cooperative,a Touchstone Energy Cooperative, is proud to introduce the Co-op Connections Card, a new program that helps members receive discounts on products and services from participating local and national businesses. Each NEC member receives a Co-op Connections card free of charge. There is no signup required and no annual fees. 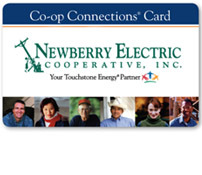 You get your Co-op Connections card just by being a member of Newberry Electric Cooperative. 10% to 60% discounts on prescriptions at pharmacies nationwide, including CVS, Walgreens, Walmart, Target and more. The Co-op Connections card is just one more benefit of being a cooperative member.